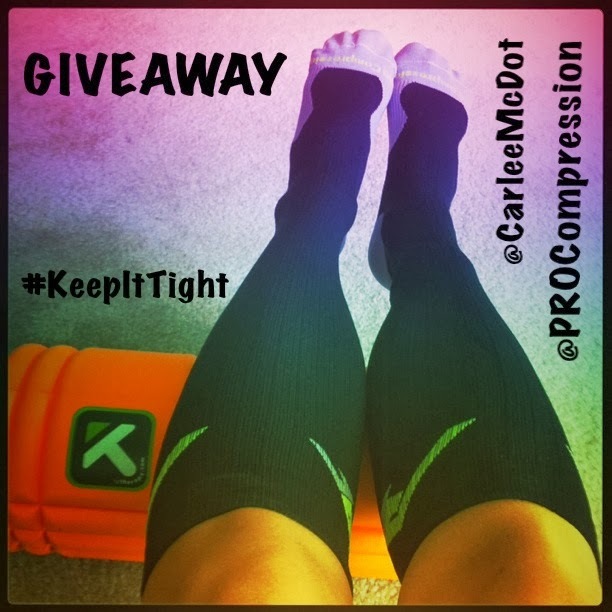 Carlee McDot: PRO Compression GIVEAWAY! I am soooooooooooooooo excited to be able to post this! PRO Compression was thrilled with the response of my last Giveaway, so they offered to sponsor ANOTHER ONE!! If you don’t know about PRO Compression, you are really missing out. You should check out my review here or just trust me when I say THEY ARE AWESOME! I was ALSO given a COUPON CODE that is valid this week, SALE. It is good for 40% off everything on the site [including LOWS]. If I was you I would probably stock up on ALL THE PRO Compression gear BEFORE entering the Giveaway – that way, even if you don't win, you still make out like a bandit! Love my compression socks.....could use a new pair! I really want the Marathon Black pair! I LOVE PRO compression socks! And could always use more!! I asked for a couple pairs for Christmas! I have my fingers crossed that I get at least one! I want the retro or black. I so want ther Holiday ones! Super Cute! I want the chevron ones soooo bad! I really want the purple ones! I like the Marathon Limited Edition "MJ" Neon Pink with Stars! Black with neon pink argyle! I like the Marathon, Pink with Black Argyle!!! I love PRO Compression. I really want a pair of royal blue and a pair of powder blue marathon socks. Those retro socks kill me. I LOVE THEM! I want the holiday socks! But I'm curious, are these socks more like the CEP socks in texture (they have more of a woven fiber feel) or are they more like the 2XU style - more of a sheer/nylon type? I Like the Royal Blue! Hope Santa helps out this 5K first timer! I love them ALL, I can't decide. I would love a new pair. Love the light blue ones! I love pink...so I would ask for the marathon pink socks. Thank you Santa! Black and Neon Pink Argyle!!!! neon yellow and pink swirl fo' sure! I'd pick the Limited Edition "MJ" Neon Pink with Stars, love hot pink! I am liking the Marathon Retros for some reason! I would love the Chevron or the neon green! 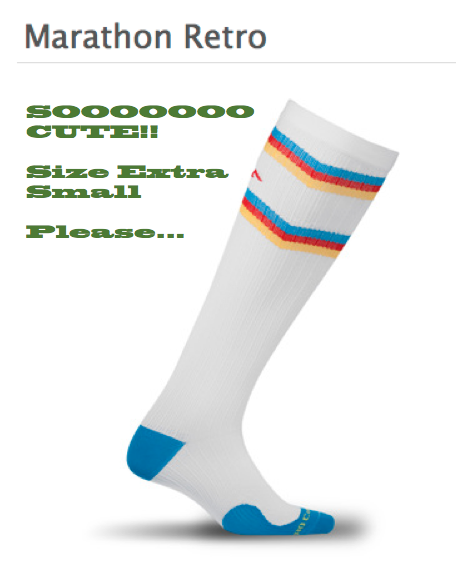 I'm addicted to ProCompression and LOVE the Marathon Retro Socks! I think I'd like the holiday ones, they seem so festive! I love the purple....oooh calf sleeves...or socks! eek! Definitely the neon pink with stars!! I seriously LOVE Pro Compression. By far my favorite running purchase of the year! Loving the yellow marathon socks! If I am brave I'll do the yellow. But I'll probably just get the black. I love the blue, or even the retro!. I LOVE the pink with black argyle. So cute! I love pro compression! I'd either choose the black & pink argyle or the royal blue compression. I love the retro marathon sock! I've had my eye on it for a while. LOVE! I love the Marathon powder blue! Thanks. I love the argyle pair! I asked for the Marathon Pink socks. I need a powder blue pair for my Cindy costume for the PHM! Oh jeez..... I'd go with the retro! I like the retro ... and often wear pro compression. Kinda likin' the neon blue or the marathon retro! I love neon yellow or pink! Would love to try the calf sleeves in grey! I love the blues! Though the xmas one looks pretty fun! I love the pink ones!! I asked Santa for the Chevron and pink ones. Love them both! black but i'd go with another color too! Santa, please give me some white ones. The holiday ones - they look so cute! Would love a pair as I am battling some tendinitis and these would really help. Plus, they're super cute! I'd love the neon pink and yellow swirl! 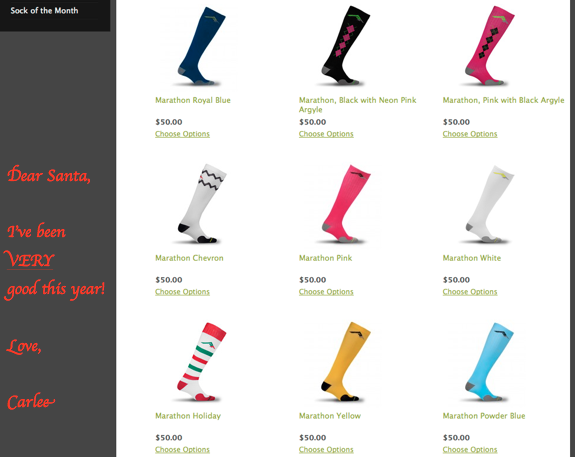 I would like to have the Marathon Holiday socks. I'd ask for Marathon purple. I asked Santa for a pair of Black ProCompression Marathon Socks. I'm asking Santa for Marathon Chevron! I love the holiday socks!